A very simple introduction to using a terminal emulator and a simple BASIC application to cause some digital outputs to change state based upon the state of digital inputs. In this tutorial, we will use two push buttons for inputs and two LEDs for outputs. We will watch the inputs and display output patterns on the LEDs based upon what the inputs are. This may seem really, really basic, but the concepts you learn in this tutorial will be the foundation of all other UBW work, so it makes sense to start simply. Please reference the documentation for the firmware you have on your UBW. The current version (as of 10-16-07) is for Firmware D 1.4.2. We will use the "V" command to see that our UBW is operating properly and to find out what version it is. We will use the "C" command to configure the digital inputs and outputs. We will use the "I" command to read the digital inputs. We will use the "O" command to output digital outputs. We will have our two switches connecting to Port A bits 0 and 1, and out LEDs will connect to Port B bits 7 and 8. These bits are completely arbitrary, you could certainly use any of the other I/O pins on the UBW, as there are lots of them. I took one of the UBW kits that spark fun sells, put male headers into the holes pointing down, and plugged it into a breadboard for this tutorial. You can do it however you want - my way is definitely not the only way to get this to work. Note that we use 470 Ohm current limiting resistors with the LEDs (so they don't burn out) and 4.7K Ohm pullup resistors on the switches so that the Port A inputs pins are either getting +5V (through the pullup resistor) or are shorted to Ground through the switch. You can use the Hyperterminal terminal emulator that came with Windows, or a different one (I use TeraTerm Pro Web). No matter which one you use, make sure to turn OFF any hardware handshaking when you open up the port. After connecting your UBW, and wiring up the circuit shown above, you need to find out which COM port your UBW has connected on. Go into the Windows Device Manager, and look under Ports (COM & LPT) to find out which COM port your UBW is on. If all of your ports say "Communications Port (COMx)" and you don't know which one is the UBW, then double click on each port and look for the one that says "Manufacturer: Microchip Technologies Inc.". Let's say it is on COM4. We'll use that for this tutorial, but substitute whatever value yours is on. The "V" command stands for "Version", and it just asks the UBW to send back some standard information. It tells you what firmware version it is, and lets you know that it can receive your commands, and that you can receive its replies. Now you know that you have a valid connection to your UBW. Next we need to tell the UBW what our inputs and outputs are. We use the "C" command for this. Type the following in, and press Enter at the end of the line to send it to the UBW. The "C" command stands for "Configure" and it has four parameters (for a 28 pin UBW). Each parameter is separated by a comma. The first three parameters are decimal values that represent which bits of each port you want to be inputs and which ones you want to be outputs. The first parameter is for PortA, the second for PortB, and the third for PortC. If you send a zero for any of these parameters, you are telling the UBW that you want that port to be all outputs. If you send a 255, you are saying you want all of the bits of that port to be inputs. Each bit of the number represents one of the pins in the port. So, for example, if you wanted to make Pin0 of PortB an output, Pin1 an input, and Pins3 through 7 outputs, you would use (binary) 0b00000010 (which is 2 in decimal). You can make each pin in each of the ports an input or an output. We want to make PortA Pin0 and Pin1 inputs, so we'll send a 3 (decimal) for the PortA paramter, and then all other pins outputs, so they all get zeros. For our example here, the C,3,0,0,0 tells the UBW that we want bits 0 and 1 of PortA to be inputs, and everything else to be outputs. The last parameter is the number of analog inputs to turn on. We don't want any, so we leave that zero. The "I" command stands for "Input" and it has three parameters (for a 28-pin UBW), each separated by a comma. 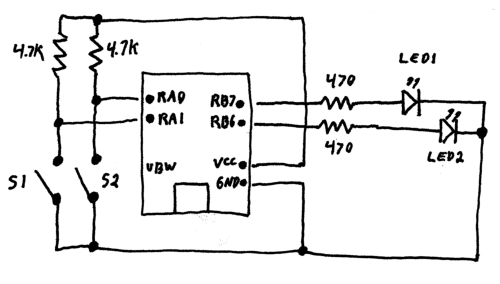 The parameters are decimal values that represent which bits of each input port are high, or +5V. The first parameter is for PortA, the second for PortB, and the third for PortC. Again, each bit of each number represents the status of one pin on that port. So in the above response, we can see that my PortA Pin0 has +5V on it, which means the switch is not closed. PortA Pin1 switch was also +5V, meaning not closed. If you keep typing "I" over and over again, as you press and release each switch, you can see the bits representing their states change. You will get a 000, 001, 002 or 003 for the first parameter of the I response from the UBW, which is telling you the state of the two switch on PortA Pin0 and Pin1. Note that the paramters that the UBW sends back to you on the PC are always padded with zeros. This is to make the processing of those messages very easy. You know that, for an "I" command responce, the 5th charater from the front of the string will _always_ be the ones digit of the PortA digital input parameter. If the numbers were not zero padded, then their positions in the string would change as their values changed. So, you may have been wondering why there is a 001 in the PortC digital input parameter above. The reason is because the UBW was outputing a HIGH (1) on PortC Pin0 at the time that I sent the "I" command. Can you figure out (from the UBW schematic) why this would be? I'll give you a hint : it will 'blink' on and off. Now for lighting up those LEDs. Lets say you wait for both switch inputs to be HIGH (i.e. +5V) and then you want to light both LED, but all the rest of the time you want both LEDs to be dark. You use the "O" command, which takes 3 parameters, again, one for each port. It will turn on bit7 and bit6 of PortB, which will output +5V at PortB Pin7 and Pin6, which will turn on both of our LEDs. By using the I and O commands, you can read any inputs and set any outputs to either high or low states. The real power of all of this does not lie in using a terminal emulator. What a lot of typing just for two silly LEDs! But we needed to learn what to do. Now, we can have some real fun. The power of the UBW comes from the fact that the PC can read the values of the inputs and write to the outputs, all under your program's control. What? You don't have a program? Cool. We'll make one right here. Download and install Liberty Basic.Type in the following program (or copy/paste), but be careful to change the "COM4" part to whatever COM port your UBW is on. This program will configure the UBW, then continuously read the inputs and set the LED outputs automatically based upon the inputs it sees. It will loop through 100 times and then stop.
' what to do based upon that response. So there you are. You now have a very configurable AND gate. The LEDs only turn on if both switches are pressed down. That's an AND gate! Now you know the basics. There are many more interesting commands to learn, but with just the information contained in this tutorial, you could easily make 8 LEDs blink in any pattern you like, you could use your two switches to 'click' in a pattern, store it in your application, the play it back on your LEDs, you could make the buttons cause a light pattern on the LEDs, etc. And that's just with switches and LEDs - you can (using various circuits, all of which can be found on the web in different places) connect your UBW up to infrared detectors to time slot car or pine wood derby races, you could connect your UBW up to your Christmas lights to make different patterns, etc. etc.